But fads and surges of popularity come and go; these explanations hardly account for why, in a short amount of time, tens of millions of people suddenly flooded into a familiar—indeed, 150 year old—American card game, frenetically expending tens of billions of dollars on it. The poker boom wasn’t a case of a 150 year old sport that suddenly skyrocketed in popularity because credit was cheap. It became not only for the first time in it’s history a good spectator sport, it was also the first time you could play it easily online from your home. Throw a good story on top of that and you have an explosive mix. I also doubt that the 2003/2008 period was the first time in the history of poker that interest rates were low. So why didn’t we see a poker boom somewhere in the past? 2. Was it a bubble? I’m not the only one to criticize the author, and he actually already addressed some concerns in this blog post. The author asserts that the explosion in poker’s popularity was a classic speculative boom. I’m not so sure about that. Did we have a Fifty Shades of Grey bubble the past years? Is there an Angry Birds bubble? I don’t think anyone is going to answer yes on those questions. The books and games are consumption goods, and just because they are popular for a limited time doesn’t mean that it’s a bubble. Poker is the same: it’s not an asset class that you can speculate on, it’s entertainment. If it’s popular people spend more money on it, but nobody is buying poker chips expecting that they can resell them a year later for more money. A lot of people buying poker books doesn’t make a bubble. 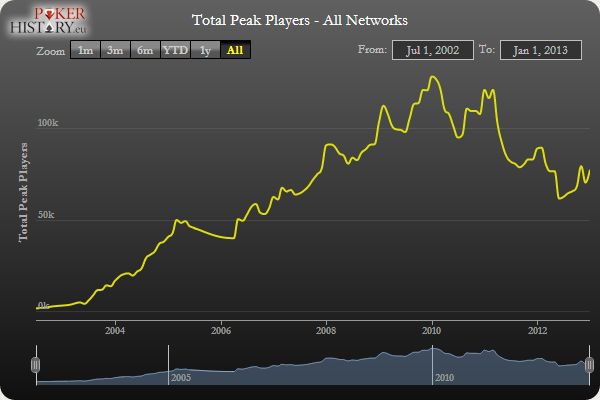 Looking at the above graph it seems hard to argue that the poker boom ended in 2006. Only after the United States Department of Justice pressed charges against the three biggest online poker operators on 15th April 2011 we see a big drop in activity, a day known as Black Friday in the poker community. Regulatory developments are a way better explanation of the popularity of poker than interest rates. The big drop in people participating in the 2007 WSOP Main Event, used by Earle as an argument that the poker ‘bubble’ deflated simultaneously with the housing market, is also explained by regulatory developments. In 2006 the UIGEA act was passed, resulting in the exit of PartyPoker from the US market. At that time PartyPoker was the biggest online poker site, and a substantial amount of players were send to the live tournaments through online satellites. The fact that a number of poker shows stopped broadcasting in the 2006-2008 time frame is also a poor indicator for a bubble bursting. Those shows were sponsored by the online poker sites, and with a number of them withdrawing from the US market due to the new regulations it’s not a surprise to see some shows getting cancelled. I think the premise that the FED created the poker bubble is flawed in almost every way possible. Something can be temporarily popular without being a bubble, the popularity of poker continued far after the FED increased interest rates, and the regulatory changes provide a more logical framework for explaining the decline in popularity. And if Austrian economics explain why we have had a poker bubble, can it also explain why we didn’t have a table tennis bubble? And how does it explain the “pogs” bubble in the 90s? The popularity of poker and low interest rates are in my opinion just an accidental weak correlation, not an explanation. And you can certainly not explain developments in the brick and mortar poker business while ignoring online poker or regulatory changes. This entry was posted in Off Topic on February 23, 2013 by Alpha Vulture. I read that article and was just shaking my head in disbelief at how weak the causation argument was. I agree with you on that article’s conclusions – they are ridiculous. The author has serious man-with-a-hammer issues and can’t see the real explanation which is otherwise pretty simple and obvious (i.e. what you said in your post). The interesting thing is what happens if America were to open up now, given there are signs that the country is relaxing its attitude towards online gambling. Would this drive further growth, or is poker inherently ‘faddish’ and the fish which are needed to drive the whole ecosystem have been largely burnt out? I think you’re right there. I used to work for an online gaming company and the stats on how fast the losing players lost in cash games as a % of their volume (stakes) were amazing. The game is much tougher than it was during the boom because you had so many weak players joining and the average skill level was so much lower – even with a shark or two on the table they still lost relatively slowly and got a lot more ‘play’ for their money. The problem is that these players churn away fairly quickly so it’s the job of poker rooms to keep spending money trying to bring them in. However, given that the sharks churn slowly and the fish quickly over time this leads to a tougher and tougher poker ecosystem and the new players now lose very quickly – which in turn drives up the churn rates of these players, which in turn makes the games tougher, etc etc in a positive feedback loop. It also makes the game less competitive for the recreational players compared to alternatives e.g. sports betting, casino games etc. Does this picture seem consistent with your experience? Yes, I think that’s a fair assessment of what’s happening with online poker games, but a lot of other dynamics going on at the same time as well. There is of course a limit on how though a game can become because at some point good players start quitting as well. Oh don’t get me started on that! One of my research reports in my previous job was arguing against offering aggressive rakeback deals (sorry!) because they largely attracted the sharks and not the recreational player base who preferred other loyalty schemes. This problem is probably worse at the company I was at because they were on one of the poker networks and the incentives there are very perverse – the individual white labels just want to ‘generate rake’ as badly as possible and don’t care about whether the player is actually bringing losses to the ecosystem. Given the bulk of the rake is ‘paid’ by the multi-table winners they are the best target for their marketing (even if they effectively pay it with money won from other losers!) but if everyone pursues the same strategy then the ecosystem is terrible. I’d hope that the marketing departments at single provider systems are more savvy but given the high level of stupidity I observed in the industry generally I wouldn’t count on it!